Last night I was invited, along with several other local writers and bloggers, to a special media dinner at The Woods. Having settled into their new brick and mortar kitchen, Bread and Circuses wanted to flex their culinary muscles a bit, and entice us with some delicious new dishes, each one designed to pair well with the beers and ciders you’ll find on tap at The Woods. We were treated to a five-course pairing dinner, featuring a combination of Bread and Circuses’ standbys, as well as a few of their newest creations. We were welcomed to the event with a beer or cider of our choice and some Duck Fat Popcorn. If you’ve ever found regular popcorn a bit dry and bland, then you should try this. Popping in duck fat and seasoning with brewer’s yeast and sea salt give this popcorn a rich flavor that plain or even buttered popcorn just can’t match. Once everyone had arrived, Two Beers Brewing and Seattle Cider Company founder, Joel VandenBrink welcomed us and gave us a full tour of the brewery, the cidery and their brand new, just completed retail space, which will be ready to open to the public in just a couple of weeks. I’ve been a regular at Two Beers Brewing since the first iteration of The Woods, when the brewery first moved from a tiny storage space to its current location on Ohio Avenue South. It’s been quite an experience watching them grow, expand, launch Seattle Cider Company, expand again, and their growth shows no signs of slowing. Even as their latest major expansion nears completion, they’re still preparing to bring in more beer and cider fermenters and increase both their beer and cider making capacity to keep up with demand. They blow through a full truckload of cider cans each week and Joel told us they’re preparing to start brewing beer around the clock – brewing four times each day. That’s amazing. As we completed the tour and we made our way back to the table, Syd Suntha from Bread and Circuses welcomed us to the evening and presented us with an appetizer of House Pear with brie, rosemary, truffle oil and sea salt. A classic appetizer executed competently. It was a great palate cleanser following our welcome beer or cider and a wonderful way to entice us for the courses that lay ahead. First up was one of Bread and Circuses’ most popular items: the Brusssel Sprout Caesar. This was a hearty salad with crispy prosciutto, Parmesan, croutons and a pepperoncini pickled egg and it paired quite well with Seattle Cider’s new Olympic Honey cider. I haven’t always been a fan of Brussels Sprouts, but I think that was because, growing up, my mom always boiled them to death until they were mush. No such worries here. They were firm, crispy around the edges and made for a great opening course. The main ingredient of our second course was something I’m used to having a sushi, but Bread and Circuses went a different and quite delicious way with it: Beer Battered Unagi (eel). Served over a potato funnel cake (to keep that ‘circus’ theme going) with Daikon slaw, yuzu tartar and a Thai chili syrup, this was probably my favorite dish of the evening. The seasoning in the slaw was slightly tart and reminded my palate a bit of the light soy and wassabi flavors you’d usually associate with eating Unagi. It paired excellently with Two Beers’ Crooked Belgian Wit, complimenting the flavors of the dish rather than competing with them. Next up was a dish I’d had a preview of at another event I attended just this past weekend, but I was quite happy to have it again: Kalbi Short Rib, served over a Cannellini bean cassoulet with savory white cabbage and parsnips. This was a very rich and satisfying dish and the short rib meat was done on the rare side, a plus in my book. It was paired unexpectedly but quite pleasantly with Seattle Cider’s Cold Brew Coffee Cider. It has a decidedly different character than any Cold Brew Coffee beers you may have had; slightly sweet with a clean and crisp but not overpowering coffee flavor. For me, the beer was the star of this next course: Seared Octopus, served with puffed farro, Fresno chili escabache and carmelized fennel over a red radish arugula salad and served with Two Beers’ new Wonderland Trail IPA. I enjoy a good octopus dish and this one was tasty, but almost felt like it was trying to do too much. Sometimes simpler is better. It did pair well, however, with Wonderland Trail; Two Beers’ newest IPA, having been introduced just this past November. It has a wonderful, well-balanced, tropical hop character and is already becoming even more popular than Two Beers’ original flagship IPA: Evolutionary IPA (Evo IPA for short). We were starting to feel full at this point, but the end was in sight. Our final course: Foie Churros, served with Espresso Stout chocolate sauce, was paired with Two Beers’ wonderful Overhang Bourbon Barrel-Aged Imperial Porter. This was a a great way to close out our evening. The Churros keep in step with the ‘circus’ theme of Bread and Circuses, and Overhang is one of Two Beers’ most popular and most complex beers. Aged for 8 months in bourbon barrels (Even Williams and Four Roses to name a few), Overhang is then blended back with a bit of other batches of Overhang from previous years. 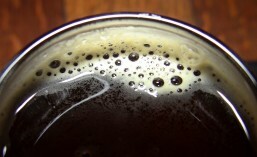 It has garnered a number of awards for Two Beers Brewing. The Woods is becoming quite the destination in SoDo. With Two Beers Brewing Company, Seattle Cider Company and Bread and Circuses all in one place and all stepping up their game, everyone should be able to find something they’ll love. As you can see, Bread and Circuses is committed to changing your perceptions of what ‘bar food’ can be. Sure, you’ll still find their popular Circus Burger with fries and a few other familiar items on their menu, but be on the lookout for more creative and upscale dishes like you’ve seen here in the future. So, the next time you’re trying to decide where to go for dinner and a few drinks, think The Woods. I think you’ll enjoy it. To see more photos from this evening, please visit my Facebook page. This entry was posted in Bacon, Beer, Best Of, Brewing, Cider, Collaboration, Events, Expansion, Food, Local, Pairing, Seattle, Service Review, SoDo, Tasting, Washington, Washington Beer, Washington Cider, Winter and tagged 2016, beer, Bread & Circuses, cider, Dinner, January, Pairings, seattle, Seattle Cider Company, SoDo, two beers brewing. Bookmark the permalink.